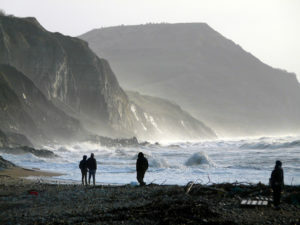 The coastline at Charmouth is part of a Natural World Heritage Site listed by UNESCO, which is also popularly known as the ‘Jurassic Coast‘. The international recognition is due to the 95 miles of Devon and Dorset coastline exposing geology from three distinct periods in the evolution of our environment, representing 185 million years. Millions of years ago the earth’s crust tilted and eroded bringing older rocks to the surface, with the area around Lyme Regis and Charmouth from the Jurassic Period (201-145 million years ago). This means that Charmouth and Lyme Regis Fossil Hunting is renowned across the world, with many specimens now displayed in museums in many countries. 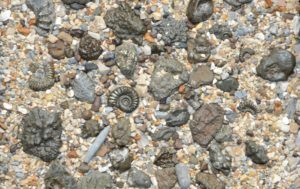 However, the Charmouth and Lyme Regis fossil beaches are not just for the professional collector, as with a little help from the Charmouth Heritage Coast Centre all the family can find ammonites and belemnites on the beach. Occasionally you may also be lucky and find part of an Ichthyosaurus or Plesiosaurus. As you travel to Charmouth from the east the coastline changes, from the chalk cliffs west of Poole, through the unique rock formations of Lulworth and Durdle Door, to the 18 miles and 180 billion pebbles of Chesil Beach and the Fleet Lagoon. The cliffs at West Bay will be particularly familiar to fans of the television series Broadchurch. To the west of Charmouth there is the Lyme Regis ‘ammonite pavement’ on Monmouth beach, with many exposed ammonites in the rocks. And further west you move into the Triassic red cliffs of Devon and the historic pretty coastal villages of Beer and Branscombe. 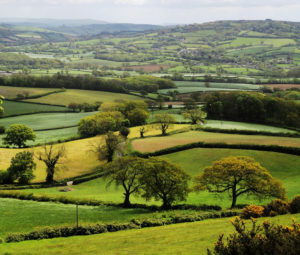 With over 40% of Dorset classified as an Area of Outstanding Natural Beauty (AONB), beautiful scenery is never far away. From the rugged naturally eroding coastline, to the rolling hills and vales, there is something for everyone, whether you travel on foot, by bike, or by car. The protection that this designation provides, ensures that development is minimal and the landscape and rolling hills retain their beauty, attraction and peacefulness. The area around Lyme Regis and Charmouth appear regularly on television programmes, whether as an ideal escape from the city, the setting for period dramas, or in documentaries exploring the natural history and geology, and many locations will be familiar to most people. Inland from Charmouth the Marshwood Vale through to the Blackdown Hills offer the walker and cyclist a network of country walks and quiet country lanes though rolling farmland and ancient woodland.